The surgical treatment of both cancer types is basically a wide excision of the lesion followed by various forms of reconstruction and closure. I’ve made two videos of wide excisions. The first is actually a re-excision of a basal cell carcinoma (BCC). The patient had had an operation earlier at another hospital, but the surgeons here was not satisfied with the margins, so a new excision was scheduled to cut both wider and deeper around the area on the left temple where the lesion had been located. The video still above is from this video. After removing the skin piece, the wound was closed in two layers (subcutis and cutis). A skin excision repaired with the use of z-plasty. The other excision video is of a patient with a malignant lesion right below the left eye. The defect resulting from the excision is covered with a Mustardé cheek flap with a z-plasty at the lateral end. The z-plasty is done to make the scar less contracted and better looking. Left inguinal lymph node dissection. I have written about the filming of this third video before. It is a left inguinal lymph node dissection on a patient with malignant melanoma. I was deeply fascinated to see the dark color of the metastatic lymph nodes they removed from the patient’s groin. The dissection is very meticulous and delicate. The great saphenous vein passing through the nodal packet. The lymph nodes located in the triangle between the inguinal ligament, the sartorius muscle and the adductor longus muscle is removed in one nodal packet. The great saphenous vein passes through the packet and is therefore clamped, cut and tied. When the nodes are removed the femoral vein, artery and nerve are exposed. At the end of the video you get to see the infamous black nodes. Photodynamic Therapy (PDT) of basal cell carcinoma. The last video I’ve also posted on before. 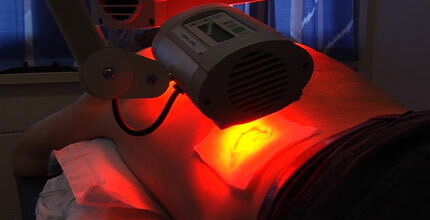 This is not surgery, however, but treatment of basal cell carcinoma using red light. After curettage the skin lesions are rubbed with a medical cream that makes the cancerous cells sensitive to light of a certain frequency. After about three hours of letting the cream do it’s work, the lesions are exposed to red light. This creates singlet oxygen in the cells, which causes damage to the cell membrane and mithocondria, and the cells die. Doesn’t sound too bad, but as you can read in my older post, it can be excruciating for some. You’ve been given an Arte y pico Award. Please, check my blog for details. Great videos as always. Do you have a copy of the Lymph node dissection in English? Reblogged this on The Face Of Skin Cancer. You are currently reading Skin cancer and melanoma videos at The Sterile Eye.